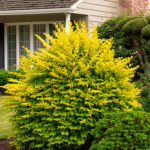 See below for shrub descriptions and info. Click “Shop Now” to be taken to our store and full inventory of trees. 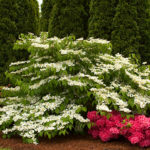 Dwarf shrub that will provide brilliant summer interest with masses of bright white blooms that cover the fine green foliage, long after many plants have stopped flowering. Full sun. Develops a dense rosette of dark green leaves with a distinctive blue cast. 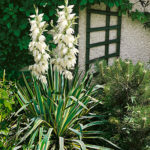 Flowers in summer with grand spires of fragrant snow white bells. Suited to containers. Full sun. 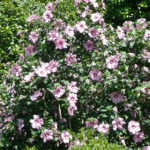 Althea, commonly called rose-of-Sharon, flowers in late summer, providing a flush of color after other flowering shrubs have begun to fade. Full sun. Dense, rounded, spreading habit. Easily grown in average, moist, well-drained soils. Prefers loams with consistent moisture, but tolerates a wide range of soils. Prune as needed immediately after flowering. Full sun. Pure white flowers, much larger than others of the species. Flowers appear in late spring to summer, often continuing into fall. Strong, straight stems hold the huge flower heads up well, despite heavy rain. Sun to part shade. Flat-topped heads of rosy pink flowers cover this low, spreading shrub. 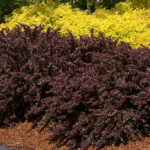 New spring foliage is an attractive reddish purple. This more compact form requires little pruning to maintain a neat size. Sun to part shade. Upright, rounded and multi-stemmed. Prefers moist loams, but tolerates a wide range of soils. Established plants have some drought tolerance. Sun to part shade. 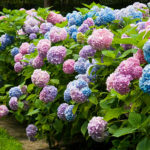 They are very durable, fast growing plants that are offered in a staggering variety of sizes & colors. Full sun. Upright with deep burgundy foliage and large, bright red berries. Birds don’t like the fruit, so the berries often persist well into winter. Showy fall color and long-lasting fruit. Sun to part shade. 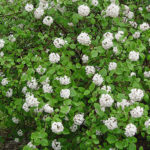 A lovely medium-size shrub with erect branches that arch gracefully. 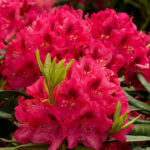 Displays profuse clusters of small, bell-shaped, pink with yellow throat flowers for a great summer accent. Full sun. 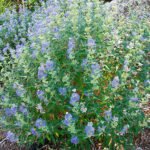 Low-mounded and valued for its aromatic foliage and late summer flowers which are said to resemble clouds of blue smoke or mist. 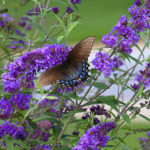 Flowers are very attractive to butterflies, bees and other beneficial insects. Full sun. Bright red berries from fall through winter. 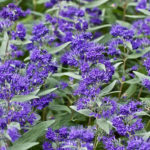 Displays dense, blue green foliage on purple stems. 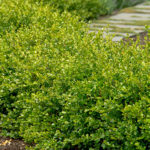 Excellent hedge or foundation shrub. Sun to part shade. Upright, clumping, deciduous shrub with arching branching. Early spring bloom of double white flowers. 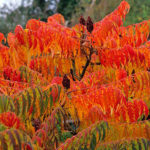 Foliage often develops attractive red-orange-yellow fall color. Full sun. 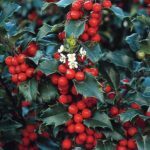 Improved, compact selection noted for its lovely white spring flowers followed by larger, more abundant glossy red fruit and brilliant red fall foliage. Sun to part shade. 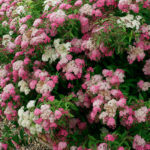 Clusters of pinkish white spring flowers with a spicy-sweet fragrance and beautiful, lustrous, dark green foliage. 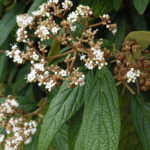 Upright, fully branched form well-suited as a hedge, screen or accent plant. Sun to part shade. Vigorous shrubs with a spreading habit, producing long spikes of red, white, lavender, pink, yellow and dark violet flowers June-September. Full sun. 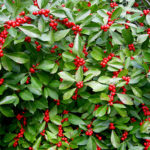 Produce large to small, linear leaves that are stiff and evergreen. Colors range from white to pink, red, and purple. Sun to part shade. 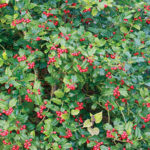 Boasts a profusion of bright red berries each fall. Dense branching habit takes shearing well. Excellent heat tolerance. The berries are a valuable food source for birds. Sun to part shade. Pristine white flowers bloom on long, upright panicles in mid-spring. The dark green, heart-shaped leaves provide an elegant compliment to the clustered blossoms. Full sun. Sensational accent or natural hedge desired for the intense scarlet red fall coloring. Interesting compact, mounded form displays attractive rich green leaves spring through summer. Full sun. 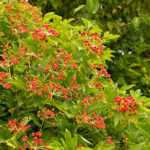 Dwarf deciduous shrub grown for its dense mounding habit, smaller size and brilliant scarlet fruit display. The many branches are covered with small glossy tri-lobed leaves. Sun to part shade. Monoecious flowers bloom on bare branches in late winter to early spring before the leaves emerge. Smooth, light bark is gray-brown. Fruit is a hard edible brown nut enclosed in a leafy, hairy, light green husk. Sun to part shade. Low hedge or groundcover formed by spreading branches that display an interesting herringbone pattern. 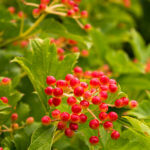 Small, pink flowers in spring are followed by large, beautiful red berries that brighten the winter landscape. Sun to part shade. 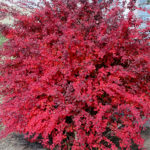 A dwarf, densely branched form displaying deep crimson colored foliage all season long. Best color when planted in full sun. Excellent color contrast against green or gold-leaved plants. Full sun. Intense orange, yellow, and scarlet fall coloring from soft, fern-like foliage. Intriguing winter silhouette created by the upright, multi-stemmed habit. Excellent specimen tree. Good in containers. Sun to part shade. 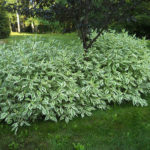 Compact, mounding shrub with dense, fragrant, silver-gray foliage and deep purplish blue flowers that attract butterflies to the garden over a long blooming season. Valued for late summer to fall flowers, when little else is in bloom. Full sun. 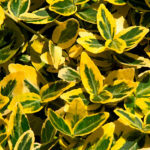 Golden yellow, frosted foliage tips create a striking contrast with the pendulous, blue-green mature foliage. 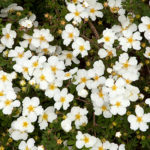 A good selection for mass plantings or a groundcover for hot, dry banks. Full sun. Brilliant yellow flowers in early spring. 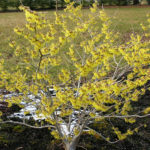 A dwarf forsythia cultivar that is noted for its compact-spreading shape. 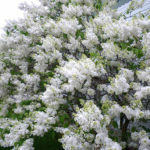 Early bloom makes this shrub a true harbinger of spring. Fast growing with a semi-arching habit. Sun to part shade. Deep, emerald green leaves edged in sparkling white are tinged with pink in winter. 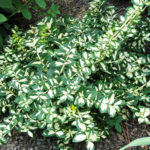 An evergreen shrub with a dense, erect habit excellent for small clipped hedges and foundation plantings. Sun to part shade. Bright green leaves with gold edges, turning pinkish-red in fall and winter. Spreads by creeping stems that root where they touch the ground. Gently climbs with support. Full sun. 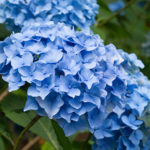 Can bloom for months in warm areas, especially if deadheaded regularly, and the flower heads—blue on acid soils, pink on alkaline—are up to 9″ across. Sun to part shade. Hardy deciduous shrub, valued for its display of vivid blooms in spring. Foliage is yellow, orange and red in the fall. Plant in well-drained, acid soil. Sun to part shade. Leaves are narrow, giving the whole plant a graceful, ferny appearance. Foliage turns yellow in fall. Sun to part shade. Lacy fern-like foliage combined with a narrow columnar habit make this a fantastic plant for adding texture and shape to the garden. Foliage turns yellow in fall. Sun to part shade. 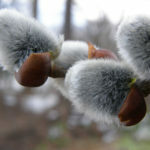 Dainty branches covered in fuzzy catkins are sure signs that spring is around the corner. Produce large, fuzzy, silvery buds. Sun to part shade. 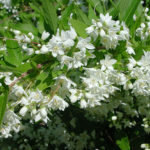 Gracefully arching shrub displays bright, glossy foliage backing fragrant, bell-shaped white flowers. Use as screen, hedge or barrier. Beautiful landscape specimen. Sun to part shade. 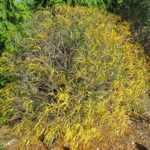 Displays attractive, non-burning foliage with a golden orange cast most of the season. 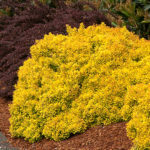 Excellent low-maintenance color for the landscape from spring to fall. 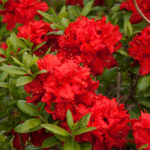 Brightens beds and adds vibrant contrast to shrub borders. Full sun. 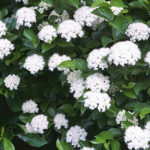 Upright deciduous shrub best used for informal, unclipped hedges. Bright golden foliage lasting all season, especially when planted in full sun. Fall foliage takes on a purple-red tone in fall. Full sun. 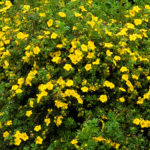 A versatile small shrub that charms with its cheery yellow buttercup-like flowers. Fine-textured green foliage on a mounding form. 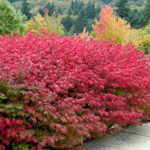 Use as a colorful accent in shrub borders. Full sun. 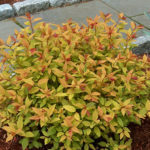 A dense, upright mounded shrub with attractive bronze-tinged new growth in spring, that matures to a soft yellow-green and develops into a brilliant coppery orange in the fall. Panicles of rosy red flowers rise above the foliage in summer. Sun to part shade. 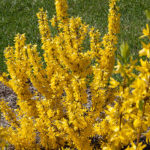 Vibrant golden spring foliage, accented by clusters of pink flowers, cools to a yellowish green in summer then a rich, yellowish orange in fall. Sun to part shade. 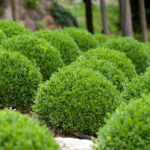 A full-bodied boxwood well-suited for dense, low hedges. Foliage retains its rich green color throughout winter. Vigorous, rounded form if not pruned. Sun to part shade. Red-purple fall foliage color lasts into winter to make this a standout in the landscape. Slender clusters of fragrant white flowers add to the multi-seasonal show from this award winning plant. Sun to part shade. 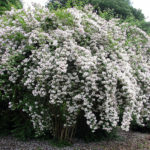 This dwarf grower makes an excellent hedge or border plant. The dense twiggy habit displays an abundance of black berries through winter. Sun to part shade. 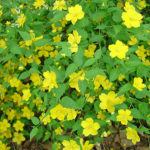 Double-flowered cultivar that features rounded, pom-pom-like, yellow flowers. 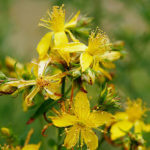 Single, five-petaled, rose-like, yellow flowers bloom somewhat profusely in spring. Double-toothed, narrow, ovate-lanceolate, bright green leaves turn yellow in fall. Sun to part shade. Large clusters of spicy-scented, waxy pink flowers fade to white. Bright red berries fade to black in fall. Foliage becomes red and burgundy in autumn. Sun to part shade. 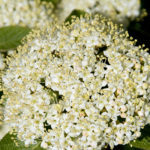 Produces flat cymes of creamy white flowers in the spring and berries in early fall which first appear red and then change to a glossy black. Ovate-oblong to ovate-lanceolate leaves are dark green, somewhat shiny and puckered. Sun to part shade. Dainty clusters of rose-pink blooms create a pleasing contrast with the low-growing, mint green foliage. Forms a neat compact rounded form that fits nicely in shrub borders. Full sun. 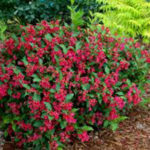 A neat, compact, mounded shrub with vibrant red new leaves. 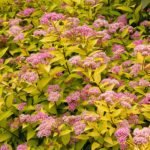 Clusters of small pink flowers contrast with bright gold mature foliage that turns rich russet red in fall. Full sun. 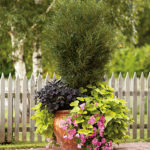 Dense, lush, dark green foliage and a naturally neat formal appearance, without pruning. Inconspicuous mid- to late summer flower clusters produce small but attractive, pink ornamental fruit in the fall. Full sun. Broadly rounded form supports tiered horizontal branches that display the magnificent, large, white, lace-cap flower clusters. The pleated, green foliage may develop fall color in some regions. The red fruit in fall is very ornamental. Sun to part shade. 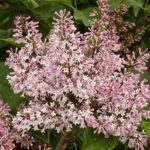 Enjoy a spectacular display of rosy-pink blooms against a backdrop of purple-tinged foliage. 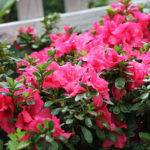 Use to add color in shrub borders or as a garden accent. Full sun. Compact, upright cultivar. Lavender to ice blue, sweetly fragrant, single flowers are arranged in dense, terminal clusters. Full sun. One of the most effective displays of bright, orange-red fruit, lasting for four weeks in midsummer. 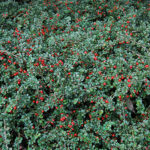 Also selected for its compact growth and dense, dark green foliage, great for hedges. Sun to part shade. Deep green leaves have a large, bright yellow blotch in the center. 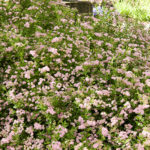 Mass for a vibrant groundcover or line along drives and walkways or a low hedge. Also useful for cascading out of containers. Sun to part shade. Bright neon red flowers appear over a long period and are offset by a neat mound of rich green foliage that becomes dark burgundy in fall. 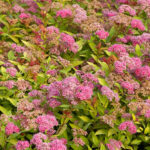 Creates a colorful low hedge or mass planting. Full sun. 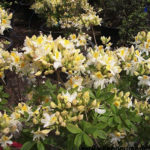 Superb shrub for accent, specimen or border use in semi-shaded areas; desired for the splendid, abundant, showy flower clusters. Handsome foliage on boldly branched, mounded form. Blooms on old wood. Full sun. An extremely hardy selection that provides a massive display of bright, mandarin orange blooms in the spring before the foliage emerges. 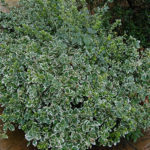 Small mounding form with lustrous green foliage. Sun to part shade. 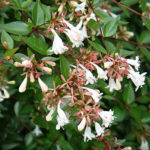 Dense-growing, small evergreen shrub valued for its large trusses of showy flowers. Thrives in cooler regions but some protection from winter wind is helpful. Sun to part shade. 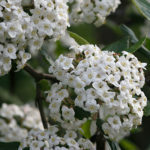 Large, dense 6 to 8 inch long clusters of white flowers are held upright above the dark green oak leaf-shaped foliage. Flowers become rose-pink in the fall and leaves turn deep red-bronze. Sun to part shade. 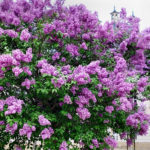 Abundant clusters of sweetly fragrant, purple flowers in mid-spring. 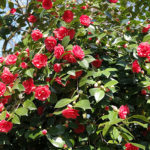 Vigorous, upright, multi-stemmed shrub with heart-shaped foliage. Ideal as a flowering hedge or screen. Sun to part shade. 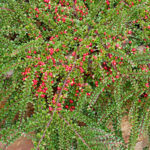 Spiny foliage emerges with bronze-red coloring, turning green and eventually a purplish-red in the winter. Brilliant yellow flowers are followed by deep blue berries. Sun to part shade. 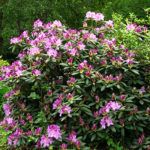 A durable yet charming rhododendron with small trusses of bright lavender-pink blooms contrasting with small dark green leaves. Evergreen foliage takes on a mahogany-brown winter color. Sun to part shade. 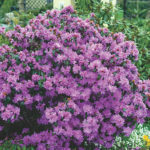 Prized for its masses of light pink flowers and deep purple foliage. Small black fruit follows flowers. 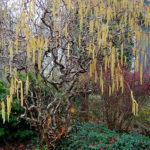 A beautiful accent plant either as a multi-branched or single trunk specimen. Full sun. 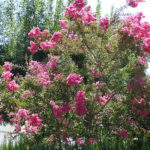 Large, double pink flowers appear in April, then rebloom in early July, continuing through fall until hard frost. 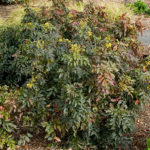 The evergreen foliage is disease resistant, maintaining good color year-round. Sun to part shade. 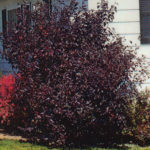 Showy foliage is purple-red throughout the summer months, then turns a deep amber color in fall. 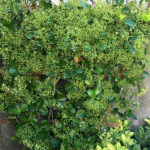 Dense branching habit makes a superb hedge or barrier plant. Full sun. A compact, mounding shrub featuring gorgeous red tubular flowers against dark green foliage. 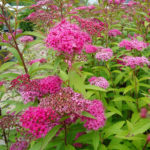 Highly effective in mass plantings, mixed perennial beds, or as a container accent. Full sun. Current year’s growth features outstanding coral-red branches on a multi-stemmed shrub. Yellowish white flowers are followed by small blue berries. Bare stems create an attractive winter accent, and are a wonderful addition to seasonal flower arrangements. Sun to part shade. 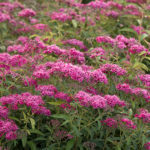 Tough, easy and adaptable – great for rock gardens and banks! Cool fall temperatures bring a brilliant flush of color to finely textured, glossy foliage and highly ornamental red berries. Semi-evergreen in colder areas. Sun to part shade. Graceful branching makes a wonderful hedge, barrier planting or single accent. 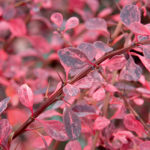 Deep rose-red foliage is mottled with white and green in spring, bringing wonderful, warm color into the landscape. Bright red berries in fall and winter. Full sun. 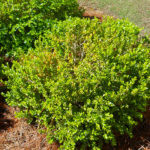 Small deciduous shrub with bright green leaves on slender stems. 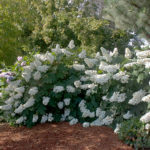 White, pink and red bloom clusters cover this dwarf, dense, mounded plant. Full sun. 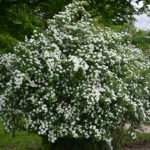 A low-growing dwarf shrub with bright green leaves on arching branches that becomes a wonderful and showy accent when covered by white double blooms in spring. Foliage displays a deep burgundy fall color. Sun to part shade. 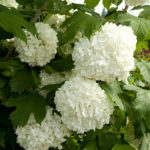 Masses of large, pure white, snowball-like flower clusters make a showy display and are exquisite in floral arrangements. Glossy, bright green leaves have a purplish red fall coloring. Sun to part shade. 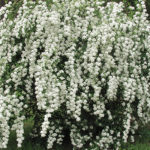 An easy to grow shrub with graceful, spreading branches, dark green foliage, and an abundance of white flower clusters that provide a spectacular show in mid- to late spring. Sun to part shade. 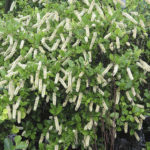 An easy to grow, spreading woody shrub. Bright sunny yellow, 3-inch flowers with prominent stamens. Spreads by stolons to make a dense mat of flowering stems. Thrives in poor sandy soil. Sun to part shade. 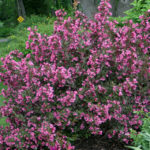 Beautiful spreading shrub with fiery red, apple-blossom-like flowers that precede leaves each spring. Produces greenish-yellow fruit. Full sun. 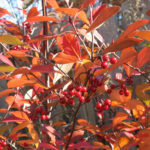 Variegated leaves, attractive berries, stunning fall color and showy red stems in winter make this wonderful shrub for all seasons! 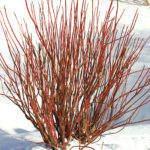 Vigorous and adaptable, naturally forms a thicket of upright, blood red stems. White berries are often tinged blue or green. Sun to part shade. 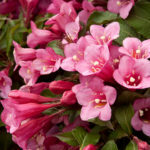 Gracefully arching shrub boasts densely clustered, 1″ funnel-shaped pink blooms which are especially attractive to hummingbirds. Flowers from late spring into fall. 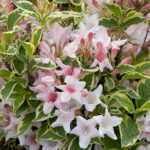 The foliage is as distinctive as the pink flowers; its oval leaves are variegated—green, edged with creamy white. Sun to part shade. Flowers in axillary clusters appear in mid to late winter prior to the emergence of the foliage in a variety of colors ranging from pale yellow to dark reddish purple. Golden yellow fall color. Sun to part shade. Rosy-pink flowers add a touch of romance when displayed against the dark glossy foliage. The foliage is much darker than that of older varieties like Java Red. 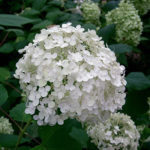 Produces copious amounts of flowers in spring, and will re-bloom throughout the summer. Sun to part shade. 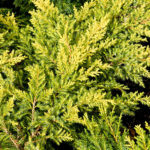 Among the hardiest of the small-leaved boxwoods, the rich green foliage can acquire a golden bronze hue in cold winter zones, but is one of the first to become green again in spring. Sun to part shade. Produces copious amounts of dark red berries when a male is planted nearby. 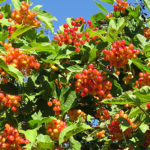 Offering superior fruit set and retention, this native shrub performs in wet areas, with good mildew resistance. Sun to part shade. 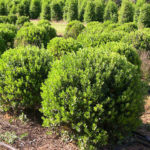 Dense, compact, many-branched, broad, mounded evergreen shrub with a loose and open habit. Apetalous, greenish yellow flowers appear in spring. Flowers are sparse and insignificant, but quite fragrant. Sun to part shade.